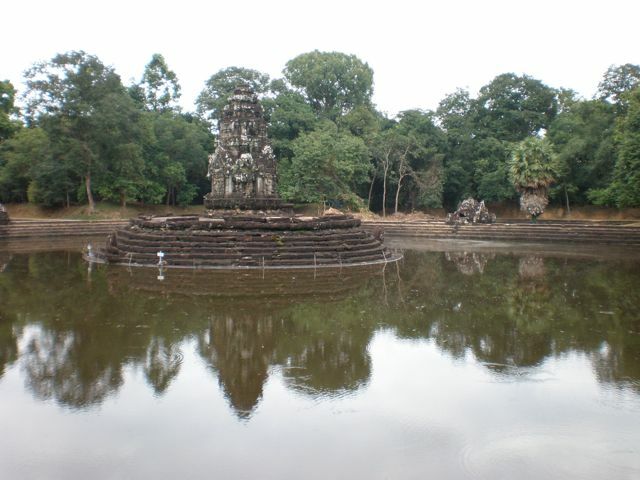 "Neak Pean is a tiny temple and was built by Jayarvarman VII. The King ordered the construction of a vast baray (reservoir) east of Preah Khan temple to provide water to its hundred-thousand support workers." Some people may be wondering why there has been so little mention of the temples as that is the primary reason the vast majority of people visit Siem Reap. For one, there is so much information devoted to the temples that I don’t feel like I have much to add to that body of information and experience. The other reason is that we didn’t really visit many temples this time. I did go to see my favorites which included Banteay Srei (which I previously wrote about in The Lingas and the Lady), Angkor Wat, Bayon, Preah Khan, and Neak Prean. Unfortunately the visit to one of my real favorites, Ta Prohm, fell victim to my conviction I was leaving on Sunday when on Friday I discovered I was leaving on Saturday. "Preah Khan, meaning 'sacred sword', is a huge, highly explorable monastic complex, full of carvings, passages and photo opportunities. It originally served as a Buddhist monastery and school, yet it was more than just a monastery, it was an entire city enclosing a town of 56 hectares. About 100,000 farmers produced rice to feed about 15,000 monks, teachers, and students." to this limited number of temples. One was using once in a while a very interesting downloadable audio tour of some of the temples from Tourcaster either during, before or after the visits when reviewing my photos. The second was the entirely different perspective I gained on the Angkor empire from the excellent recent coverage of the subject by National Geographic. I highly recommend reading this material before your temple visits. Thanks to the style and depth that is unique to good stuff from National Geographic, I was able to visualize and feel the immensity and complexity of this social, spiritual and engineering wonder that makes the Angkor temples and the Angkor empire so unique in world history. But the third and most special difference this year was going to see the temples with Chov. I was moved by his quiet and reserved sadness when we witnessed all the evidence of the poaching that has been done over the years of these marvelous antiquities. I was also impressed by his emotional connection to the great ancient history that his people has experienced. 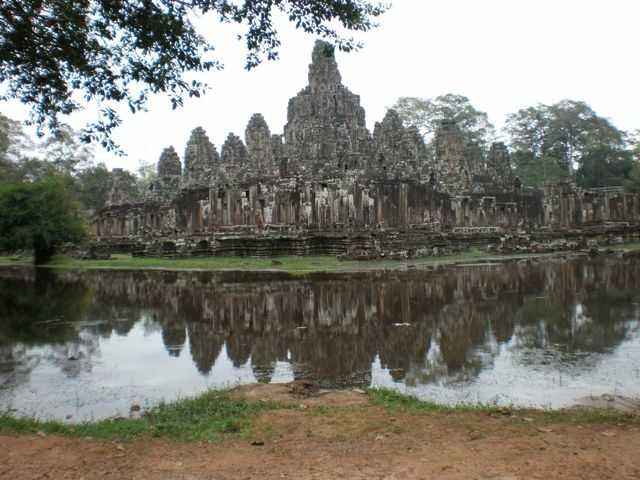 "The Bayon was Jayavarman VII's state-temple and in many ways represents the pinnacle of his massive building campaign. Bayon features fascinating bas-reliefs on its exterior walls. Some contain real-life scenes from the historical sea battle between the Khmers and the Cham, and others give a unique insight into Angkorian daily life depicting market scenes, cockfighting, chess games and childbirth." He spoke of what a shame it is that more attention is not given in school to the ancient Angkorian empire. I asked if he saw in the temples merely interesting antiquities or his past. He answered that he thinks most Cambodians unfortunately only see interesting antiquities while a minority perhaps experience some spiritual connection since these were all mostly once temples. But for him, these remains represented his past and the historical roots of himself and his people. Later he continued to talk about his admiration for Jayarvaman VII who was one of the greatest and most productive of the Angkorian kings. At this point in the coversation we were waking around Bayon, Jayarvaman VII’s state temple. The temple originally had 54 towers with what some believe to be a combination of Buddha and the face of Jayavaman VII carved into the four sides of all 54 towers (only 37 towers remain standing). It was as if he was inspired by the presence of the king whose spirit if not face dominates Bayon. 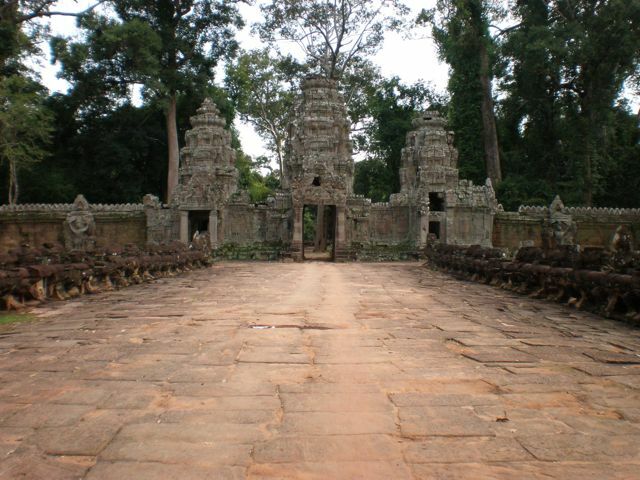 Is Angkor's future to be found in Angkor's past? When I later looked at the portrait I shot of Chov next to the face that dominates Bayon, the similarity in looks and serene strength of both faces was striking. Chov was quite touched in his quiet and reserved way when I remarked that perhaps the spirit and strength of Jayarvaman VII resides in his own soul (something of which I myself am convinced now that I know Chov so well). The Cambodian nation and people has lost so much from its thirty year period of devastating social destruction. To rebuild the spirit of a nation is an extreme challenge when the cultural and intellectual foundation has been destroyed. I wonder if one way to reconnect to a well-spring of strength, deep roots, historical continuity and pride that any peoples need to flourish could partly lie in reviving the knowledge, appreciation and embrace of ancient Angkor – one of the most unique spiritual, social and engineering marvels the world has ever seen. ~ by Leonard on October 29, 2009. And thanks for stopping by and taking the time to comment. Be well and happy trails! I have continued to follow your account of your experiences in Siem Reap and Luang Prabang and personal responses to all you’ve met and seen. Thank you for your sharing your thoughts and observations in such an empathetic way. My husband and I had a special time meeting people and enjoying the town and outlying area in Luang Prabang last year and hope to return there. I’m also guilty of not being able to put my camera away for long ! I found the Laos people to be so friendly and happy to have their photos taken. With the help of interested passers by, I did manage to get names and addresses of quite a few and sent them copies later. We have a month to wait until we go to Siem Reap and from your accounts I am expecting much more hustle and bustle and a different atmosphere to that of Luang Prabang. Very exciting! refreshing and relatively remote hill village ] after Siem Reap, I will have plenty of quiet time to focus on just that. Thank you and safe travels, wherever you go next. Sorry for such a delayed response from me. Laos has been so captivating in a totally different way than Cambodia and the Internet is in many places not so good, so I have not had a lot of time or opportunity to be online without getting frustrated with the slooooooooowwwww speed. But that’s the charm of Laos in general as you know :)… I am sure you will enjoy Siem Reap and your get-away place in Sri Lanka sounds very special. Have a great time and thanks for taking the time to be in touch. Warm regards! 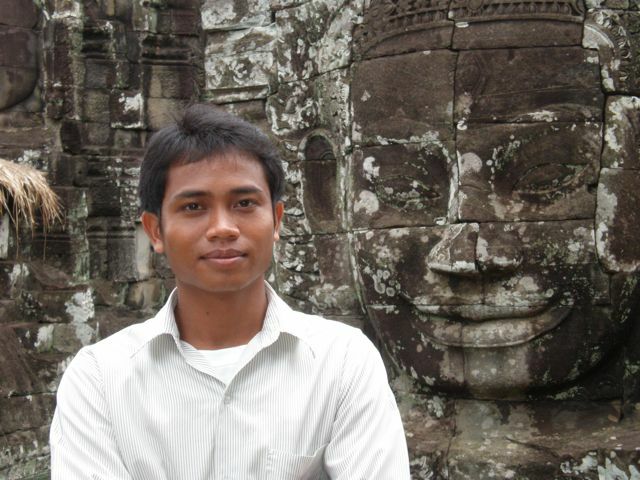 I have heard many inspiring stories about Siem Reap from friends who have visited this mysterious yet intriguing place. But none more inspiring than the personal account from yourself as you have touched on the human aspect which is mostly missing from ordinary tourist. I truly admire your tenacity in helping the people of Cambodia. I had initially hesitated listing Siem Reap on my travel list as I have 2 young kids, but I now believe my worries are unfounded. I now look forward to the trip next week with my family and enjoy the charms of Siem Reap. And thank you for the website on Savuth, hopefully am able to engage his reliable service. Thank you very much for coming by and taking the time to leave a comment. You shouldn’t have any problem with 2 kids. Some friends of mine from Australia have been making a half year trip through SE Asia with four young kids and they are having a ball. You can check out their stories and experiences at http://www.travelblog.org/Bloggers/6-go-mad-in-asia/. And thank you so much for your kind words. I have been deeply touched by the Cambodians I have met and those who have become important to me. It has been and remains an enormous growth experience for me as a person. And, it would be great if you get in touch with Savuth through the website before you visit. Be well! 4 days in Siem Reap last week with Savuth in his tuk-tuk was the most fulfilling and gratifying trip I’ve had. My 2 kids were amazingly in love with Siem Reap and they love roaming around the ruins of the temples and even climbed up Kbal Spean to see the Lingas. We were awestruck by the amazing (understatement)carvings on all the temples, be it Angkor Wat, Banteay Srei, Ta Keo, Ta Phrom, Kbal Spean or Angkor Thom. And definitely not forgetting Savuth, our reliable tuk-tuk friend who was like a family member guiding us and taking us around Siem Reap for the 4 days. It was indeed our good fortune to have him with us and needless to say, thanks to you for making it possible to be in touch with him. Savuth will definitely be on our list of recommendations to all our friends who wish to visit Siem Reap and experience the joy of riding a tuk-tuk. The simplicity of life in Siem Reap and the ability of the Cambodians to wear a smile on their sleeves everyday despite the hardship of life has certainly left an indelible memory. The picturesque smiles of the children, be it bicycling, playing in school, fishing at the water tunnel or along the village at Tonle Sap are beautiful sights to behold and will forever be etched in our memory. We hope to return to Siem Reap again in the near future and top of our list would be a visit to Sangkheum Center for Children and perhaps Savuth’s village which we have inadvertently missed (our misfortune). Thanks for introducing us to Siem Reap and Savuth. God Bless You. Hi there! Thank you so much for taking the time to give us some feedback. I am so happy that everything worked out so well. It is an amazing place full of wonderful people and I see you and your family discovered that. I do hope you make it back and it sounds like you will. Perhaps we will be there one time at the same time and can meet, or hook up in KL one time when I am there. I wish you and your family all the best of good health and good fortune. I would like to use Savuth’s tuk-tuk services, but I am a bit confused!! How do I get to also use the services of Chov?? I am going to be in SR from 5th to 8th March 2010 – I am an Irish lady – 65 years of age – fairly fit – travelling through Asia for 56 days. I am in SR before going on to Luang Prabang and am staying at Mother Home guest house for 3 nights. Help gratefully received – thank you for such great info – I shall read Nat. Geog. report and also download the other info – greatly appreciated your report. Thanks for stopping by and taking the time to comment. I will get directly back to you via email regarding you question.